The African American Civil War Memorial, at the corner of Vermont Avenue, 10th St, and U Street NW in Washington, D.C., commemorates the service of 209,145 African-American soldiers and sailors who fought for the Union in the United States Civil War. The sculpture The Spirit of Freedom, a 9-foot bronze statue by Ed Hamilton of Louisville, Kentucky, was commissioned by the DC Commission on the Arts and Humanities in 1993 and completed in 1997. The memorial includes a walking area with curved panel short walls inscribed with the names of the men who served in the war. 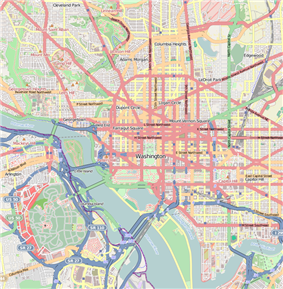 The complex is located at the eastern entrance to the U Street station on the Washington Metro, served by the Yellow and Green Lines. The memorial was developed by the African American Civil War Memorial Freedom Foundation and Museum. It was transferred to the National Park Service (NPS) on October 27, 2004. The National Mall and Memorial Parks office of the NPS now manages the site. The related African American Civil War Museum is located directly across from the memorial at 1925 Vermont Avenue. From July 16–18, 2011, it celebrated its grand opening in a new and permanent facility at this address, with a weekend of speakers and events devoted to "Racial Reconciliation". It plans four years of activities to commemorate the 150th anniversary of the war and African-American contributions. The museum opened in January 1999 in a building two blocks west of the memorial in the historic U Street Corridor, a neighborhood traditionally the heart of African-American entertainment and theater in Washington. The museum enables visitors, researchers, and descendants of the United States Colored Troops to better understand their stories. It displays photographs, newspaper articles, and replicas of period clothing, and uniforms and weaponry of the Civil War. The African American Civil War Memorial Registry at the museum documents the family trees of more than 2,000 descendants of those men who served with the USCT. Other descendants may register. Visitors can easily search the database to find ancestors and relatives registered in the Descendants Registry. 2004 establishments in Washington, D.C.
American Civil War museums in Washington, D.C.
African-American museums in Washington, D.C.